Constructed from a premium heavy duty ballistic denier fabric and high-density webbing, the 3M� DBI-SALA� Dual Tool Belt Holster is engineered to withstand punishing environments. Heavy-duty 1" D-rings are built into both sides of the holster and are load-rated for 5 lbs. Neoprene pockets on the front and back of the holster each accommodate an optional retractor. Neoprene pockets on the front and back of the holster accommodate optional Python Safety Steel Cable Retractors. Even in rainy weather conditions, this holster stays in outstanding working form thanks to a drainage vent. The vent helps keep the holster dry by allowing water to pass through, protecting your tools from rusting, and protecting your holster from dry rot. 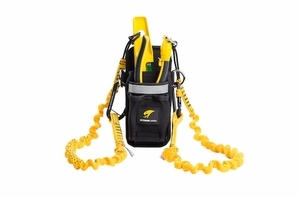 Products equipped with Hi-Vis Reflectors are always easy to identify and locate, even when left in dark spaces. Highly reflective material is stitched into the front and back of the holster allowing it to be detected in low light conditions with a flashlight. Speeds up your workflow and reduces how often your tools need to be holstered. A powerful magnetic tool staging system allows tools to simply stick to the holster ensuring that your tools are always at the ready.